Want to Live the Dream? It was Shirley’s birthday when we rolled up at Camping le Hameau in Cormatin. This is one of our ultimate favourite places and we try to call by on almost every trip through France. A big part of the appeal is its proximity to Taizé, the place we return to time and time again for a little bit of contemplation and spiritual refreshment. Staying just two miles away in the campsite gives us the chance to dip in and out of Taizé whilst making the most of the beautiful Burgundy countryside and the little town where we enjoy its simple pleasures. We had been in France for a week and this was our first stop in a campsite. We were excited! Electricity, water tap near the pitch, a laundry and a big space for each van. What more could we want? We parked up side by side and got out the barbecue. Even though it was Shirley’s birthday she was keen to be the BBQ chef so she set to with her tongs, fuelled by a bottle of beer and produced a lovely meal to enjoy in the early evening sunshine. Lunch was a real treat. Shirley and I ordered salad starters and Mary decided to miss out on the starter and nibble on the bread while we tucked into ours – it turned out that this was a good move. We’d noticed that there was a main course salad on the menu and when a lady at a nearby table was given an enormous plateful we laughed and said “Thank goodness we didn’t order that – it’s huge”. Then ours arrived – huge! We finally made it through the mountain of lettuce, tomatoes, eggs, cheese and ham and wondered if we could manage the rest of the meal but we weren’t to be defeated – food in France is served slowly and there was plenty of time to rest between courses, drink wine and chat. Every single thing we ordered was delicious and we finished with coffee at about four in the afternoon before wandering back to the vans full of Boeuf Bourguignon and fond memories. By the way, just in case you were wondering … we polished off the Sunday Buns at about 9 p.m.
After we got back to the van, wanting nothing more than a quiet nap, Shirley set off with the dogs for a comfort walk so that they would give us a bit of peace. Not ten minutes later she was back with Boo looking superior and Poppy covered in mud having fallen head first into the pond. Despite being full of food and more than a little mellow on the wine we had no choice but to bath her in her only sworn enemy – the red bucket. We grappled with her in the warm soapy water and then sprayed her down with the van’s outside shower. I then wrapped her in a towel like a baby and Mary went to take a photo – as you can see Poppy wasn’t for being swaddled, being dead set on doing one of those full body dog shakes to get the water off. The peace of the day was shattered and I limped back to the van to get changed, squelching all the way. Whose hose is this anyway? The water taps on the site were between every couple of pitches and although we use those clever extending hoses it was just a bit too far to reach Mary’s van. I get teased a lot for having loads of little gadgets in the van, just in case, but my little green hose connector came into its own that day. It might well have been sitting in a corner unused for two years but today was its day. The two hoses together created an enormous length that proved more than adequate to fill Mary’s van and I forgave her when she soaked me ‘accidentally’ when she ‘forgot’ that the tap was still on when she took it out of the filler on the side of the van. Undeterred I carefully disconnected Mary’s hose and used our single one to fill our van that was nearer the tap. Once full, Shirley offered to man the filler end while I turned off the tap. These hoses grow longer as they fill up with water and once you turn the tap off they get rapidly shorter and they are very strong. This all explains why, once I turned off the tap and disconnected the hose it pinged violently through the air and slapped Shirley, standing peacefully beside the van, across the back of the legs. She literally didn’t know what had hit her. Oh dear. Our van has relatively small water and waste tanks compared with most others so we have to fill up and empty often. It was only the next day, after a lovely warm drying day in which Mary had done all her washing and hung it on our drying rack beside our van that … can you tell what’s coming folks? … I made the rookie error of trying to do the water fill on my own. All was going well until, seeing that the tank was almost full, I sauntered over to the tap to turn it off, leaving the hose pushed into the filler. As soon as I walked away it disconnected itself from the van, hit the floor and, driven by the force of the water rushing through it, began to spin wildly around the pitch spraying water everywhere. Mary was standing beside the drying rack carefully folding her beautifully clean and dry washing and putting it into a basket when the deluge hit. Seeing what was happening and being helpless to assist I began running around in a similar wild circle shouting words that I didn’t learn in convent school. By some miracle the washing survived and stayed dry but Mary’s feet and ankles were drenched … I think she has forgiven me. After Cormatin we planned to visit an organic wine producer up in the hills to the north west of Lyon. I say that like we knew it was up in the hills before we set off. We didn’t and neither did we realise that setting the satnavs to avoid tolls for this part of the journey might have been a tad foolish. This trip was designed to not only introduce Mary to the joys of motorhome touring in France but also to show her that it can be done on a budget. One of the discussions when you are counting the Euros is whether or not to use the French motorways as the tolls add up on a longish trip. There are some decent non toll roads but these tend to be full of heavy goods vehicles whose owners are obviously also trying to run on a budget. They are also full of roundabouts. Lots and lots of them. So we left Macon on the green road going south and laboured along around numerous roundabouts and also through several villages sporting a 19mph speed limit and the town of Villefranche sur Saone. Driving two large vehicles in convoy through busy towns isn’t much fun and we were tired when we started the pull uphill towards our stop for the night. Two miles from our destination we had to do a sharp turn that involved dropping our speed down to go slow. This annoyed the several vehicles following us and they let us know with their horns that they weren’t best pleased. 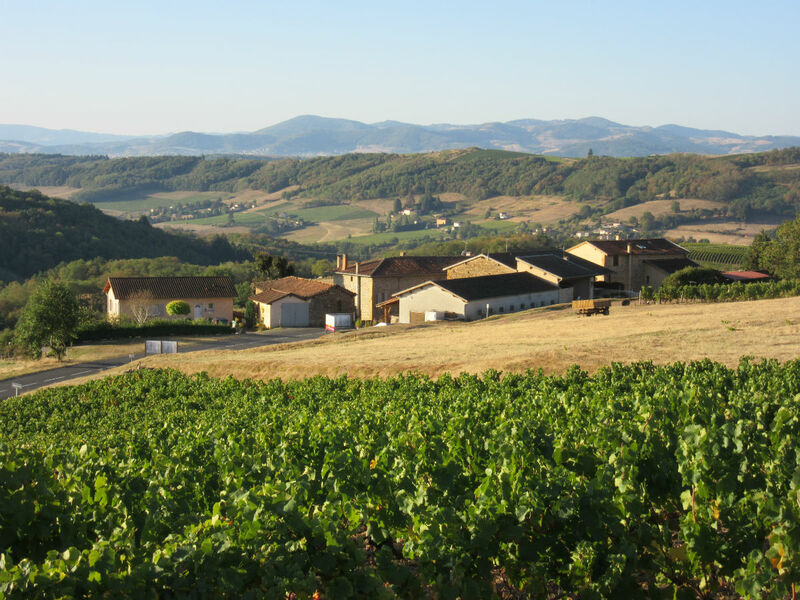 Nothing prepared us for what we were to find when the satnav proudly told us that we had reached our destination – Domaine Paire. Well to be strictly honest we couldn’t see what we had found, having turned into a small gravel space off the road but once Shirley had run into the building marked ‘Degustation et Musee’ and asked if we were in the right place we found ourselves welcomed with open arms by Jean-Jacques Paire, the Vigneron himself. We were shown to a beautiful grassy area right beside the vines, told to make ourselves comfortable and to taste the grapes that had been left on the bottom row of vines especially for visitors and to please join him at 6pm for a tasting session. The views from that hill side were breathtaking, the air crisp and clean and we were left speechless. The tasting that evening was an inspiring experience. Jean-Jacques is the sixteenth Vigneron of the family and the Domaine has been in the family for hundreds of years. He speaks good English and entertained us with interesting facts, some great information about wine whilst giving us numerous wines to taste along with small pieces of local cheese and slices of cured meat. The wine was delicious and we were particularly impressed by the obvious passion he had for his craft whilst being humorous and genuinely friendly. He told us, with a twinkle in his eye, that his father never drank water in his whole life, drinking only wine because he believed that the water was not clean enough to drink. He died at 95. Whilst recognising that this approach to long life and health is probably not one to imitate we were quite impressed and I was left with a mental image of a weather beaten, inebriated, wine maker trundling along in his tractor on the narrow roads wearing a flat cap and singing at the top of his lungs. We bought twelve bottles of Jean-Jacques’ wine and returned slightly merry to the van to try to put dinner together in some sort of order. It was my turn to cook and I’ve no idea what landed on the plates but I do know that we slept well. The next morning Mary was found in her little folding chair, soaking up the beauty and capturing it in her sketchbook. Shirley was wandering the vines with the dogs where Poppy discovered that the small grapes lying near the foot of the vines tasted sweet and I could be found standing with a mug of tea with my mouth open. This place is a little piece of heaven – if you get the chance to go we recommend it thoroughly. There is truly never a dull moment with you two 🙂 Many happy returns Shirley, looks like you had a wonderful birthday. Like Alan, I absolutely love reading about your travels and am always thoroughly delighted when a new post pops into my Inbox, so thank you both for your wonderful writing and for so generously sharing your adventures with us. Regarding poor Poppy and the Red Bucket of Shame – I was told many years ago that if you can get a towel over the dog’s head and dry that ASAP you will stop most of the shaking. It certainly worked fairly well with my Bearded Collie and believe me – until you have been drenched by a soaking wet Beardie in full shake you’ve not been drenched! Thanks Jayne, we’ll try to remember that for next time – and there will be a next time for sure. Poppy is a mud magnet. Pity she’s blonde. How lovely it all looks and very glad to be reading your posts again. How we love france, but these days we fly through to the warmer climes of Spain and Portugal. Not leaving until after Christmas this year so these pictures are making me yearn for an earlier start. Happy days! A belated happy birthday to S. So sorry not on time … blame the boxes! Removal all went according to plan. I’m still waiting for the BIG THING I FORGOT to bite me in the bum … perhaps I am on top of it all after all?!?! Very happy to be in our new home … everything the removals brought down is away, in place or up on walls. Just need to myriad of stuff down from the Aged Ps attic and then we are into projects here. Loving your recounting of odd misphaps … amusing for us to read! Big WOW on Mary’s art. She really picks up on the atmosphere of a place. What a lovely way to record the places you visit. Always such a pleasure to read your blog, very well done. I can’t believe that huge plate of salad is a starter – looks delicious anyway. Thanks also for posting Mary’s sketches, obviously very talented.